so this weekend began, for me, on thursday evening (just like college!) (or, wait, did college weekends start wednesday?) with the cardinals game. the cardinals, my friends, had an error in the bottom of the 9th that cost them the game (and, arguably, the series) and me my sanity! i was standing, pacing our living room, screaming at the television like a crazy person. (don't worry...nate was asleep so he didn't have to witness his mommy throwing things at the television.) (and tweeting angrily.) THANKFULLY, i had some friends playing darts at the good ole VFW, so i was able to meet them and drown my baseball sorrows in cheap pitchers of beer and shuffleboard. friday night i hit up happy hour with m&s (cause now that she has a boyfriend her blog name and layout totally have to change....HAHA!) for a bit, and then karl and i attended a rehearsal dinner at the Little Rock Club (schmancy!) for one of his childhood friends. We had a bit of a babysitting debacle so MANY MANY thanks to our friends brad&erin for coming over last minute and hanging out with Nate. It was so gorgeous. (gush, gush, gush) I did not bring my camera (trend as of late! sorry friends!) but there were candles and pumpkins and fall foliage EVERYWHERE. there were boots and hats and scarves and red tipped noses. the bride looked STUNNING (and smiley and happy as a bride should.) the groom and his groomsmen arrived to the ceremony VIA CANOES. they just paddled right up! there was a live band and fireworks and an outdoor bar and a bonfire and a tiered cupcake cake! 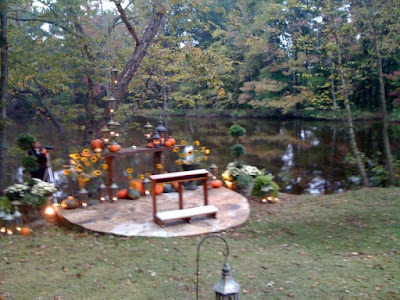 I am sure E will have some pics up soon - it was an absolutely gorgeous affair! i was so happy to be included in their special day. BOOK CLUB FOR LIFE, yo. today we had lunch with m&s once more - got to check this boy out before m jets off into the sunset. afterward we shipped nate off to gigi's so we could (you aren't going to believe this!) CLEAN OUR HOUSE. how sad is that? i know all of you with toddling children understand - it's near impossible to deep clean with a little one creating more mess as you go. so here i sit, in my clean! and quiet! house.... feeling like a lucky and loved lady....blogging while post-bath naterade (footy pajamas!) gives 'ra-rro' some love. on a blog housekeeping note, i know some of you were having issues with the new DISQUS commenting system - i changed it to let you comment with your twitter account also. please comment so i know you can OR, if you can't, email me. i have been SUPER frustrated with the blogger commenting system as of late, and i really want to switch over to wordpress. BUT i do feel some allegiance to blogger and i have been here so long! (HELLO MAY 2005!) (and i am opposed to change sometimes dammit!) I like people to know how to find me, how to get here, and not have to update their settings and feeds and blah blah blah. sigh. but i also want to be able to respond to readers via email (hence the attempt at disqus.) i have been playing around with wordpress templates. don't tell blogger.